The Best Got Even Better! Once again, AAS rises the bar in the re-creation of classic electric pianos. Not only does Lounge Lizard EP-4 deliver the authentic tone of the originals but it also preserves their action and feel. 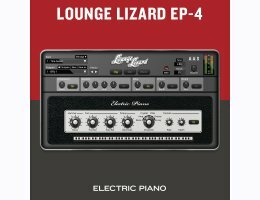 Once you get your hands on Lounge Lizard, that elusive electric piano sound becomes a reality you'll be propelled into inspirational space. The Lounge Lizard EP-4 Demo must be restarted after 20 minutes.